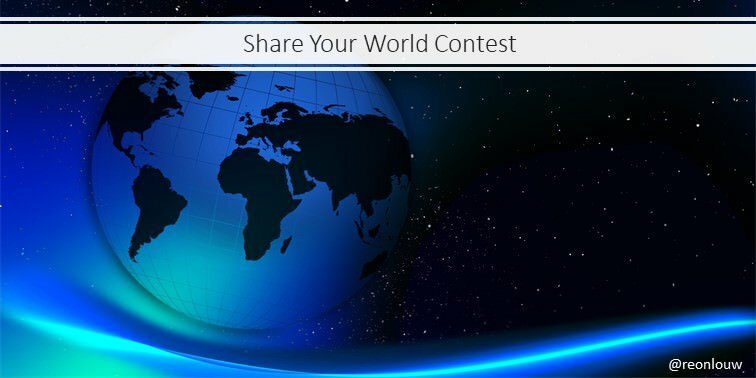 It is time for the third contest in this series of four Share Your World contests. It has been a rewarding journey thus far and I hope you can participate this time or again. The idea behind the contest is simple. You will find that I am just like you. And you will find that I am nothing like you. I want to use this opportunity to find out about your world. You can find the previous two contests here. My three favourite posts will each receive five shares of @steembasicincome. Ten additional posts will each receive one share of @steembasicincome. These will be determined by a draw from all valid entries. A @steem-bounty of 4 Steem will be created on this post. 10 people can earn 300 Superior Coin by entering this contest as a task at @kryptonia. I will resteem your post. Create a post on the chosen topic to share this with us. The post should be at least 300 words. Place a link to that post in the comments here. This will be your entry and will be acknowledged by being given a number. At least nine people need to enter for prizes to be awarded. I am looking for something that will give us insight into your world. A personal experience or perspective will count for a lot. The winners will be announced on Sunday, 9 September 2018. Last entries will be accepted on Saturday, 8 September 2018. Use #shareyourworld as your first tag. I hope that @fitinfun, @celinavisaez, @oclinton, @rvag5, @socialmediaseo, @hairyfairy, @anasuleidy, @thaishps and @colochos from the first contest and @mmunited, @thaishps, @saulos, @fitinfun, @zzuzza, @machiqui63, @joanstewart, @edwardsun55, @hairyfairy, @celinavisaez, @ashikstd, @isabelpena and @socialmediaseo from the second contest will consider entering again. The topic is twofold this time. Please include both aspects in your post. Please share your world with us! We all look forward to reading your views and perspectives.